Why are showcases so imperative? That is an excellent question you ask! At Advanced Display Systems we believe that show cases are the ultimate storage option with the trifecta of safety, protection and design. Safety – Our display cases are all completely lockable so you can show off valuable products with peace of mind. Protection – Glass storage systems are the perfect way to protect collectibles or high value items from dust or other harmful environmental factors whilst on display. Design – We custom design our products to best meet our customer’s needs. This allows the freedom of perfect visual merchandising for your brand alongside all the other amazing safety benefits the cases have to offer. Our Illuminated Display Tower is a great example of this with the added storage cabinets and the LED down light to highlight the display. 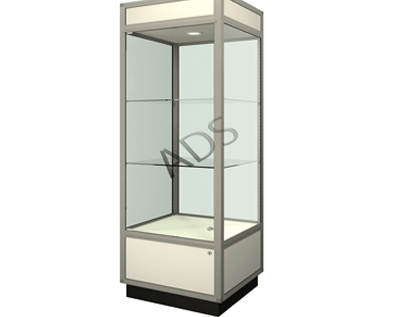 At Advanced Display Systems we have two types of display cabinet ranges on offer. The first being OUR PREMIUM SERIES of Australian made superior quality Glass Showcases. They provide custom flexibility in size and style and are supplied as a fully assembled unit ready for placement and display. The other option we provided is THE CLASSIC SHOWCASES. These are cost effective, flat pack range of glass display cases. Available in stock ready for delivery direct to your door.